A tender and colorful specialty for a salad mix, this medium-tall variety has blue green leaves that are finely cut and wavy with reddish-purple veins and stems. Use the baby leaves fresh for salads and the full sized leaves sauteed or steamed. The leaf color deepens with colder weather and makes a beautiful fall landscape planting. Kale was one of the most common green vegetables in Europe until the Middle Ages and was encouraged to be grown in the UK during World War II to supplement diets during food rationing. This make a great winter microgreen and is beautiful when paired with Golden Beet microgreens. 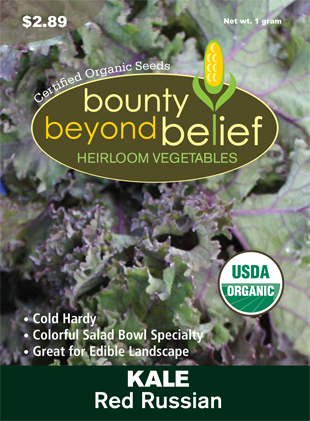 Organic Red Russian Kale is a tender and colorful specialty for a salad mix. This medium-tall variety has blue green leaves that are finely cut and wavy with reddish-purple veins and stems. Use the baby leaves fresh for salads and the full sized leaves sauteed or steamed. The leaf color deepens with colder weather and makes a beautiful fall landscape planting. Kale was one of the most common green vegetables in Europe until the Middle Ages and was encouraged to be grown in the UK during World War II to supplement diets during food rationing. This make a great winter microgreen and is beautiful when paired with Golden Beet microgreens.